Slip and fall accidents are some of the most frequent and unexpected injuries that impact people in their everyday lives. Significant injury can easily occur, regardless of age, when someone falls due to unexpected environment, obstacle, or defect. If you have fallen and been injured, you should contact an experienced slip and fall attorney at Kraemer, Manes and Associates LLC who will advocate for you and fight to make sure you are made whole. Call KM&A at 412-626-5626 or email an attorney at lawyer@lawkm.com. 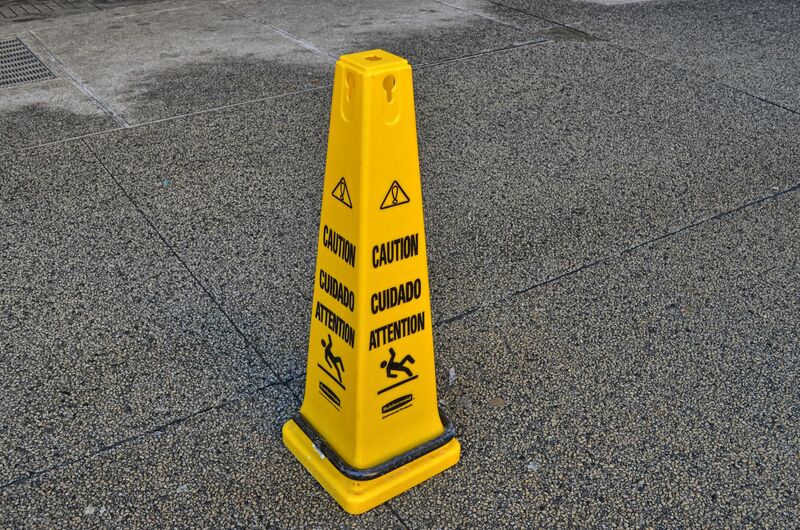 Where and How do Slip and Fall Incidents Occur? Slip and fall accidents can occur any time of year and in any situation. Year-round, the dangers of wet floors, improperly maintained carpets, and uneven sidewalks are present. In the winter, slip and falls may also occur from improperly cleaned snow and ice. Store aisles are areas that are frequent areas where slip and fall accidents occur. These areas are usually tiled, a surface that can easily become slippery and are frequently traveled. As such, owners of stores should be ensuring that their environment is safe on a frequent basis. Should they fail to take proper and reasonable care and that failure results in your slip and fall, you may have a claim against the establishment. For stores that are carpeted there is another subset of possible dangers. This includes tears in the carpet that could be tripped over. The carpet may even have an uneven bulge that poses a hazard to customers. If the ground has an object installed that could be tripped over and cause a fall the store may be liable. If this hazard did not have to be where the incident occurred, then the store has a claim for the lack of a possible hazard. For a fall that results from an uneven sidewalk, a plaintiff must demonstrate that either the sidewalk from its very beginning was uneven or that the sidewalk became a recognized danger. The improper pouring of a sidewalk is extremely rare as landowners have an interest in properly designed sidewalks. With regard to the sidewalk becoming uneven, this is often caused by the movement of the land or tree roots pushing the sidewalk up. In order to establish liability for these incidents, it must be shown that the landowner was aware of the uneven nature of the sidewalks, saw that it was dangerous, and failed to take steps to resolve it. However, if the sidewalk becomes so clearly dangerous, then the condition should be obvious to the individual who fell. The carelessness of the individual who fell thus will mitigate the liability of the landowner. Yet, these cases, like the other fall incidents, are very specific and must be analyzed based on the situation that arose and how the fall actually occurred. Contact an attorney at KM&A who will evaluate your case and help determine the strengths and weaknesses of your possible claim. During the winters in Pennsylvania, there is a significant risk of winter weather including ice, snow, and sleet that build up on walkways, parking lots, and other surfaces making them a slip and fall hazard. The time required to remove the snow and ice varies based on which municipality you currently live in. In Pittsburgh, snow and ice are to be removed within 24 hours of the cessation of the storm. Should you slip on ice or snow at a business establishment or a private property, if the natural snow and ice accumulation is obvious to a reasonable person, then there may be no liability for the establishment. However, if the buildup was unnatural, such as the movement of snow into a walkway or runoff that pools and freezes on a sidewalk, or if the establishment unreasonably delayed in cleaning up the snow and ice, then the establishment may be liable for the slip and fall and the subsequent injuries. Contact Kraemer, Manes and Associates LLC to discuss the specifics of your slip and fall and the injuries you have suffered. If you are injured from a slip and fall accident, there are three primary ways to hold the establishment responsible for the incident. If the owner or the employee caused the wet or slippery floor and did not clean it up properly or left the area hazardous to customers. Second, if the owner or employee knew about a spill or other fall hazard but failed to clean it up, the store could be held liable for slips and falls caused by this incident. The final theory for liability is that the owner or employee should have known because a reasonable person responsible for taking care of the property would have discovered the hazard and removed it. In the first two theories, it is fairly easy to demonstrate the liability because the store was aware of the hazard. The failure to resolve a hazard that should have been discovered, while less clear cut from a liability standard, is more likely to occur. Determining what a reasonable person would have done in the same situation. When analyzing the situation, it will be very specific to the specific occurrence. For instance, there will be an analysis of what efforts the owner took to ensure that the property was safe. This includes procedures to inspect the property for hazards and the steps taken to clean the property. There will also be scrutinized with regard to whether the procedures were actually followed because having a procedure which is not followed will likely demonstrate liability. There will be also an analysis of whether there could have been a warning, such as a wet floor marker, or other barrier to protect people from the potential hazard. There are other factors that will be considered as well when considering liability. Time is of the essence, a lawyer at KM&A can analyze your case and advocate for you to ensure that you are made whole for your injuries. When considering the liability from the slip and fall accident, it is important to weigh the impact that your own carelessness contributed to the accident. It is often difficult for an individual without the help of an attorney to analyze whether their actions contributed to the fall itself. One of the primary items considered will be if there was posted notice of the possible harm, such as a “Wet Floor” sign or other posted notice. Additionally, if a similar person behaving in a reasonable manner would have noticed the possible hazard and avoided it or moved carefully enough so that they did not fall would be considered. Simply acing in an inappropriate, and possibly dangerous manner, such as running through a store or acting rambunctiously will mitigate the liability of the establishment. While slips and falls may seem to be less serious, serious injuries can occur. Regardless of age, if someone slips and falls on either a wet surface, ice and snow, or other hazard, they could break their hip, fracture bones, suffer head trauma or skull factures. Hip injuries can cause people to undergo extensive treatment and long hospital stays that impact the remainder of their lives. Slip and fall accidents can easily cause significant injuries that need to be considered. Contact an attorney at Kraemer, Manes and Associates LLC to determine your next steps if you have been injured in a fall accident. KM&A is experienced with slip and fall incidents and will ensure that you are compensated for your injuries. Kraemer, Manes & Associates is dedicated to serving our clients in the best way possible. We are responsive. We are high-tech. We are fast and efficient. Most importantly, we are prepared to fight for you. With our main office in Pittsburgh, we represent injured people from accidents anywhere in Pennsylvania. To learn more about how this Pennsylvania accident law firm can help after your slip and fall accident, or to discuss your legal claims with an experienced personal injury lawyer, call KM&A at (412) 626-5626.